The addition of atezolizumab (Tecentriq) to standard carboplatin and etoposide in the frontline setting significantly prolonged survival in patients with extensive-stage small cell lung cancer (ES-SCLC) compared with the chemotherapy regimen alone. 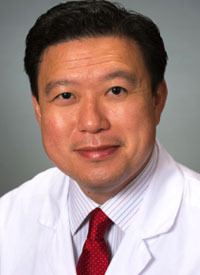 Moreover, IMpower133 is the first study in 20 years to show a clinically meaningful improvement in overall survival (OS) over the current standard of care in frontline ES-SCLC, according to Stephen V. Liu, MD. The global, double-blind, randomized, placebo-controlled phase I/III IMpower133 trial evaluated the efficacy and safety of first-line atezolizumab as adjunctive therapy to standard of care, combination carboplatin and etoposide, in 403 treatment-naïve patients with ES-SCLC. All patients received four 21-day cycles of carboplatin AUC 5 mg/mL/min IV on day 1 and 100 mg/m2 etoposide IV on days 1 through 3. Patients were also randomized 1:1 to receive either concurrent atezolizumab at 1200 mg IV on day 1 (n = 201) or placebo (n = 202) during the induction phase. Treatment was followed by maintenance therapy with atezolizumab or placebo, according to the previous random assignment, every 3 weeks until progressive disease or loss of clinical benefit. Investigator-assessed progression-free survival (PFS) and OS in the intention-to-treat population served as the primary endpoints. Secondary endpoints included objective response rate (ORR), duration of response, and safety. Age, demographics, and smoking status were representative of the disease: median age was 64 years (range, 26-90) in both the atezolizumab and placebo groups, and the majority were male (64% vs 65%, respectively), white (81% vs 79%), and former smokers (58.7% vs 61.4%). The atezolizumab arm included of 17 patients (8%) with brain metastases and 77 (38%) with liver metastases; while the placebo group consisted of 9% and 36%, respectively. After a median follow-up of 13.9 months, median OS was 12.3 months (95% CI, 10.8-15.9) in the atezolizumab arm compared with 10.3 months (95% CI, 9.3-11.3) in the placebo arm (HR, 0.70; 95% CI, 0.54-0.91; P = .0069)—a 30% reduction in the risk of death. OS events occurred in 51.7% of the atezolizumab arm and 66.3% of the control arm. Median PFS was 5.2 months (95% CI, 4.4-5.6) in the atezolizumab group compared with 4.3 months (95% CI, 4.2-4.5) in the placebo group (HR, 0.77; 95% CI, 0.62-0.96; P = .017). Atezolizumab was associated with a higher 6-month PFS rate (30.9% vs. 22.4%), and a more than doubling 12-month PFS rate (12.6% vs 5.4%) compared with placebo. The investigators saw no major difference in ORR between arms (60.2% vs 64.4%, respectively) or in median duration of response (4.2 vs 3.9 months). Atezolizumab demonstrated superior 6-month (32.2% vs 17.1%) and 12-month (14.9% vs 6.2%) event-free rates. Lastly, 18 patients treated with concurrent atezolizumab had ongoing responses compared with only 7 patients in the control arm. Median duration of treatment with atezolizumab was 4.7 months, with a median of 7 doses received. “The addition of atezolizumab to chemotherapy did not affect our ability to deliver 4 cycles of treatment,” Liu noted. The safety profile of the regimen appeared consistent with the previously reported safety profile of the individual agents, with no new findings observed. The most common grade 1/2 treatment-related AEs among the atezolizumab and placebo arms included neutropenia (13.1% vs 10.2%, respectively), anemia (24.7% vs 20.9%), decreased neutrophil count (3.5% vs 6.1%), thrombocytopenia (6.1% vs 7.1%), and leukopenia (7.6% vs 5.1%). Immune-related adverse events (IRAEs) were more common with atezolizumab compared with placebo (39.9% vs 24.5%). The most common grade 1 or 2 IRAEs among the atezolizumab and placebo arms included rash (16.7% vs 10.2%, respectively), hepatitis (5.6% vs 4.6%), infusion-related reactions (3.5% vs 4.6%), pneumonitis (1.5% vs 1.5%), and colitis (0.5% vs 0%). “These data suggest that atezolizumab plus carboplatin and etoposide is a new standard of care for the first-line treatment of extensive-stage small cell lung cancer,” Liu said.